Golf outings are becoming more and more popular and they also just became much easier to plan. How would you like to simplify the entire process around planning a golf tournament? Tim English, VP at our founding Brand, Superior Business Solutions, recently launched a new, interactive corporate and non-profit golf tournament planning guide. Golf outings are an opportunity for customers, prospects, donors or employees to come together. Whether your goal is to strengthen your team or secure relationships with customers, potential customers or philanthropists, a golf outing is a solution. Spending time outside of an office setting can help people connect. Office meetings tend to be more formal and professional, and there is value to this, but a golf tournament has a more relaxed atmosphere. This more laid-back gathering is an opportunity for everyone to have fun and share in the experience while enjoying some friendly competition and also finding new ways to connect. Maybe you are not sold on the idea of hosting a golf tournament. Tim makes a strong case for what you stand to gain by hosting a golf outing and outlines several interesting supporting points. From an influx of sales opportunities to a spike in popularity with millennials, anticipated growth and even cost-saving sponsorship opportunities a golf tournament is possibly the perfect outing for groups of any size. Golf tournaments have so many moving parts and there are so many details, and this is what makes planning difficult. 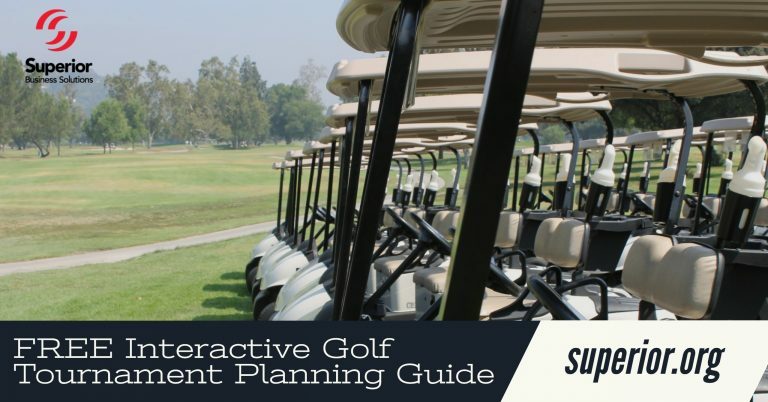 Making one good decision at the beginning of the entire process, downloading the free interactive golf outing planning guide, will make everything else flows so much easier. Working with a trusted and competent partner ensures you are able to quickly and efficiently pull together your plan and host an engaging and fun golf outing. The tried and true templates and checklists in the guide ensure every detail is taken care of, nothing is overlooked and your event will go off without a hitch. Streamlining the planning process will save a lot of stress and headaches while also ensuring all of your participants enjoy themselves. If you haven’t yet, check out Tim’s post on how to plan a golf tournament to learn why golf tournaments are a good call, and how exactly the free interactive guide can help.